We have a great solution for you, we do Bespoke Requests! Flowerbusy has proudly served its customers since 2014. For all these years of experience, we’ve learned how varied and colorful our clients can be and we consider this as the beauty of our work! That’s why we are constantly focused on fulfilling every idea, dream or a vision of our customers, no matter what. Whether you need custom designed artificial flowers or just a consultation, we are here to help! Don’t hesitate to ask our friendly team for an advice, opinion or a quote. This is the only way to learn more about our working style and standards and to fall in love with the flowers like we did. We love to face new challenges, so we will do our best to make any custom designed artificial wedding flowers bouquet you would like! We can also make millions of combinations with the products posted on our website, we can change the colors, materials, designs – basically everything you can imagine! 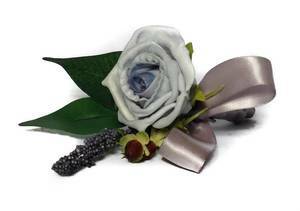 Custom designed wedding flowers – we will help you create the wedding of your dreams! The wedding day is one of the most special days in every couple’s life. It’s this moment when you start creating your own family and future. This moment will stay in your mind forever, so that’s why everything just has to be perfect. But what if it’s too hot or too cold and the flowers you ordered don’t look as fresh as you were imagining? Our team may have the solution for you! Our custom designed wedding flowers will impress even the pickiest guests. Looking just like real, we bet you can’t tell the difference! From buttonholes, pomanders, trough brides and bridesmaid bouquets to the decoration of the arch and the tables, we can take care of the whole floristics of your wedding! So if you’ve always dreamed of adding a piece of memory or sentimental value to your bouquet, so that you can impress your guests, even more, we can do this for you! We will make sure to discuss in details everything you need to know about our products so that we can make sure that our work will meet your expectations and even exceed them. We can add any material you want. Any kind of fabrics, brooches, pins etc. and we can even customize it in order to match them with the theme of your wedding. Just take a look at our designs and fill the form below. Tell us a bit more about your special occasion and expectations. We will be more than happy to hear from you!